Sunflower seedlings often escape damage from light frost, but larger plants have no tolerance of freezing temperatures. Apricot, Cucumber, Pumpkin, Squash and Sweetcorn. A rare "shelter" plant, sunflowers can be used to create shade for sun-stressed crops. Tall varieties can serve as trellises for pole beans. 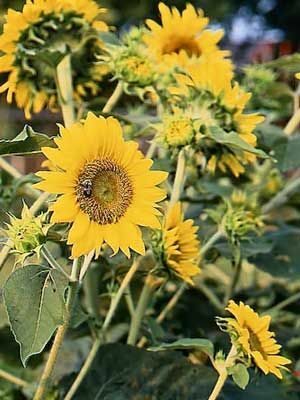 Sow sunflowers from spring to summer. Poke seeds into the soil about 1 inch (3 cm) deep and 3 inches (8 cm) apart. Thin to 12 inches (30 cm) apart in all directions for dwarf varieties. Extremely tall sunflowers or those that grow into multi-branched bushes may require 3 feet (1 meter) between plants. Sunflowers will twist around to face the most abundant source of sun, which may be away from your garden.